Discover the best of paradise on a 4-hour coach tour of Phuket Island! Wind along Phuket’s southern shoreline, marveling at white sands, lush tropical flora and the unique vibe of Patong, Karon, Kata and Rawai beaches. You’ll have plenty of photo opportunities from the seat of your comfortable coach or at each stop. Snap gorgeous shots from Karon Viewpoint and witness the sacred beauty of Wat Chalong temple. Your sightseeing tour begins with morning pickup from your central Phuket hotel. Meet your friendly guide and take a comfortable seat on the air-conditioned coach for your half-day tour of southern Phuket. Admire the striking and colorful colonial architecture of Phuket town such as the Sino-Portuguese shop houses and the Sino-Colonial mansions, and learn about the many western movies that have been shot in this unique setting. Relax and enjoy the guided commentary as you wind though lush tropical terrain en route to several of Phuket’s stunning southern beaches. You’ll discover the distinctive atmosphere of Patong, Kata, Rawai and Karon beaches, and disembark for some memorable photos. 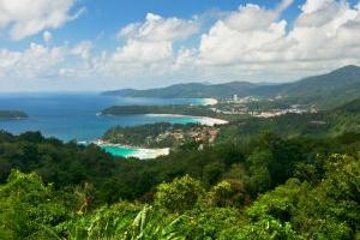 From Karon Viewpoint, also called Three-Beach Viewpoint, you’ll catch breathtaking views of the surrounding coastline and the sparkling Andaman sea. Your tour also includes a stop at Wat Chalong Temple. Wander through the complex, marveling at the exquisite beauty of Phuket’s most important buddhist temple and pagoda. Your 4-hour tour ends with a hotel drop-off. Considering the price, I shouldn't be complaining much, but the tour was not as described in totality. We visited Karon View Point, Karen lookout, Wat Chalong, and made stopovers at a small Cashew Nut factory tourist snack shopping stop and a China-owned Jewelry shop your typical tourist trap where price tags have far too many zeros. I think? we drove past the other beaches that were mentioned in the description, and drove past Phuket Town. In summary, only Karon View Point and Wat Chalong was worth the visit. The tour was good but the guide’s English was difficult to understand. It detracted from enjoying the tour. This is a nice introductory sightseeing tour of Phuket and area, with the opportunity to buy some nice fresh nuts and jewelry. The tour guide could be better. This tour is a good way to get an overview of the island with some history without having to be committed to an all day tour, especially for the price. A few suggestions to improve the tour include having a microphone and speaker in the van so folks in the back can hear what's being shared by the guide more easily and to visit or at least drive to see the Chalong Big Buddha in the mountains instead of just pointing it out. Otherwise, we learned and saw quite a bit of the island and would recommend it to others. This was a great tour to get a overview of Phuket and the area! Our guide was very friendly and we learned a lot. There were times to take outstanding photos the lookout of the ocean and beach areas were postcard worthy ! Highly recommend......well worth the low cost of the tour ! Exactly as described. Guide was friendly and was easy to understand. Small group was nice. Not my favorite tour. The guide was nice and knowledgeable but we did not appreciate the tourist stops. Not enough time in the old Phuket with a walking tour maybe and TOO MUCH TIME at the GEMS' FACTORY !!!!!!! Very basic but informative enough.